magine you wanted to study the formation of a different planet. You might consider building a rocket or even a space station. But you probably wouldn't think of building a kite. Now, a team from the University of Arizona have done just this, to understand how the surface of Mars formed. The team used satellite photographs of the surface of Mars and compared the geological features they saw to similar ones on Earth. Obtaining high-quality pictures of the surface of Mars is surprisingly easy, thanks to instruments on board the Mars Reconnaissance Orbiter spacecraft. It is much harder to get good satellite pictures of Earth. "The atmosphere of Earth causes a lot of blurring of satellite images," explains Christopher Hamilton, the principal investigator for the project. "To acquire comparable data on the Earth, we have to do it ourselves." 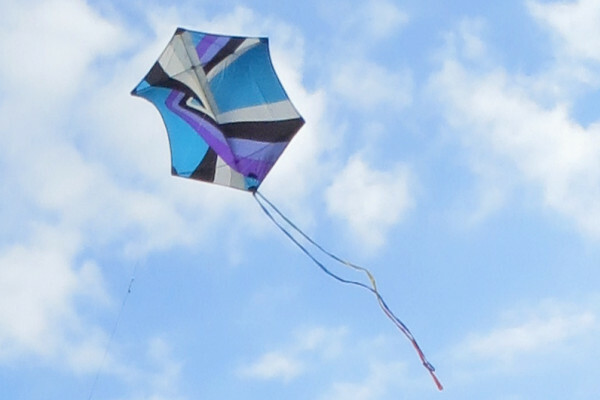 That's where the kite, brainchild of scientist Stephen Scheidt, comes in. Flown over the area of geological interest, the kite, which has a stabilised camera on board, takes thousands of photos. These pictures are stitched together by a computer to produce a detailed three dimensional map of the area. The team used the kite to survey a solidified lava flow in Hawaii. During its eruption in 1974, the streams of lava flowing from many fissures converged to make a river of magma, which inundated the landscape, creating lava lakes. These features bear a striking resemblance to channels seen on the surface of the red planet, suggesting that both may have formed in a similar way. So, could this mean that the river-like features documented on Mars are in fact old lava flows, rather than conduits for water as previously supposed? Hamilton acknowledges that there is also good evidence for water on Mars, although he stresses that this research will allow people to determine what processes occurred in any particular location. There are also interesting implications for finding life on Mars. The eruptions the team have been investigating created huge floods of lava, which may have melted Martian permafrost to leave warm water beneath. "Those environments that could support bacteria are a very promising place to look", suggests Hamilton. Next In a warming world, let it snow! Could life have come from Mars? What is the largest active volcano in the solar system?